I love the color, and the formula!!! I saw a mani with the gradient dots on Pinterest which was created by Pshiiit it looked so cute I had to try it! love this! the color is beautiful and i love the dot gradient! I like the color! Very pretty mani! love this! super pretty! the dots are awesome. The dots are great! Love the inverse on the accent nail! great colour, too! Very pretty! How much is that brand? Its new to me. Adorable! I love the accent nail! OMG. They turned out amazing. I'm obsessed with the colors. Thanks for sharing, love. This is so pretty, love the dotting and the Illamasqua. I love their polishes, so pricey but the quality is amaaaazing. love this color! :)and great mani! Great design, great color combo! So cute!! The colors look amazing together!! That color looks amazing!! Love the dots too! Gorgeous! I love the dots! I love the color of it against the white nail! 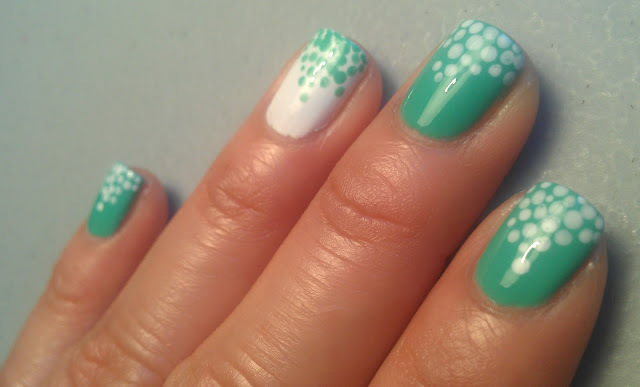 Love the mani you created with it, polka dots and accent nail. I'll probably end up grabbing a set of dotting tools from BIC. Or give toothpicks a try, perhaps. Love the dots and the negative accent nail!!! Wooo, I love it! You did great with the dotting, and I love the accent nail in negative! Amazing mani! The colors looks perfect together! I love this teal! Beautiful! I love this mani so much!!! Love the color combo, Nomad is really pretty. This is really gorgeous! I do love this Nomad color!